Joy Vertz is a professional photographer (Shoot the Moon Photography) who uses her business expertise to educate and inspire photographers nationwide. Everyone always says that change is hard. I would agree with that to a degree, but I believe that change is hard because most people resist the change, making it more of a struggle in your head than it is in reality. 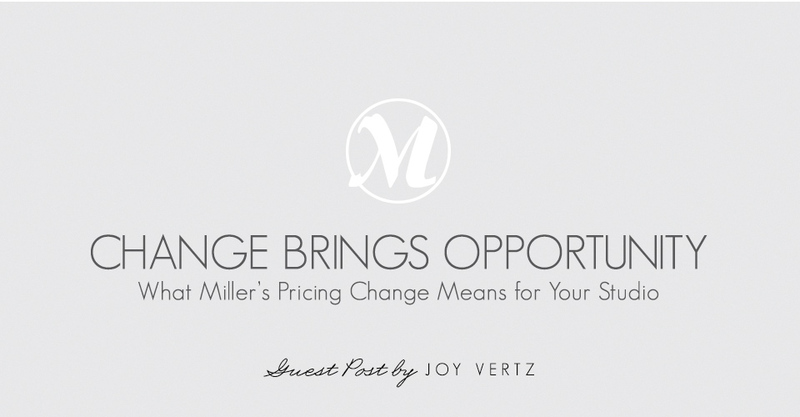 When I first received the email from Millers Lab saying that pricing was changing my immediate, defensive reaction was, “Noooooooo!” thinking it was going to produce a lot more work on my end to redo my pricing and change my product line. But when I asked more questions about exactly what was going to change and how it would truly affect my business, I felt completely the opposite. I realized this change would provide an opportunity to create popular products at a lower price point, meaning more money in my pocket. You see, I am a numbers nerd girl and after my initial reaction, I sat down to crunch the numbers like a business person. What I found was really surprising — In 80% of the orders I spot-checked my lab cost would have gone down by a bit. Great news! So let’s break down the changes and see how it will affect us and some ideas on how to adapt and make the changes work profitably for your business. 1. Minimum order charge for prints is increasing from $10 to $15 and remaining the same for press orders. $15 is still a very reasonable minimum order especially for complimentary FedEx shipping. The worst tweak we will need to address at our studio is possibly putting multiple small orders together should that be required. Not a big deal at all. If we have an order that cannot wait to be grouped with another order, we add in a few extra images as a gift or order a studio sample to freshen up our display to meet the minimum, but this is a rare instance. These are changing to our favor. We are now getting breaks at small increments which will be more beneficial when order duplicates of items. This will be beneficial for wallet size images at our studio because we will now have breaks starting at sheet 3 and then again at sheet 6. This will enable us to put together value packages of wallets for graduation portraits less expensively. For us, this is a huge thing! Proof prices are going down quite a bit and color correction is now included as a free service. “But Joy, I don’t sell Proofs— I project my work.” I hear you, but let’s think of some products we could offer where we use the economical proofs for a high end product offering! Pair a set of Proofs with a beautiful Proof Box and you have an incredible add-on product at a lower price. This is a product we sell for $1500 on its own, and the price decreases as our client’s investment increases so it becomes a lovely add-on sale and a way for our clients to get the entire session in prints. For me this is acceptable. We have not had a major price change from Millers in many years and I would expect their costs have continued to rise. Our large Prints are the largest profit center and also the area where a small increase in pricing would be least noticed by a client. A 16×16 has risen less than $4. If you did a flat $5-10 price increase of your wall portraits across the board you could easily defray any lab increase and your clients would not even blink. About 5 years ago, I raised all of my pricing on every product by $4 (products went from $155 to $159 or $665 to $669 as an example) and my clients never questioned it nor did they notice. That increase though resulted in a 40K additional sales in a year due to the sheer number of individual products we sell. Can we all let out a collective cheer? I know you are thinking, “But Joy, I want to sell big Prints!” I hear you, I do too. I sell big Prints with a majority of our sessions, however— guess what I sell at almost 100% of our sessions? Small Prints. Small Prints are typically sold in conjunction with large Prints, as order add- ons, as reorders and for the clients who opt not to buy wall art, it is the bulk of their order. The fact that this category of Prints is decreasing is great news! It will open up the opportunity to create new products as well, such as a Custom Wood Album Box filled with small Prints at a lower price point than before. 6. Color correction is now free! Guess what? Miller’s cares about the quality of our prints and is now giving color correction free! You can still opt not to select it but for those situations where the color is tricky, they will fix it for us for free, saving us time and money. A value added enhancement that our studio will appreciate.